Church of the Messiah is located in historic Rhinebeck, New York, in the beautiful Hudson Valley. Our mission is to be a place where hard questions can be asked, the healing power of love experienced and the joy of worship celebrated. We believe that God is made known in the world through our relationships with each other . . . the true connections of real people in real life. We are on a journey that we invite you to join, knowing that we will be changed by your presence. We welcome that chance to know you and to love you . . . and together to live Jesus’ commandment to not be afraid. There are three Services each week. The Sunday 8am Service uses more traditional language and is a quieter service that is more meditative and reflective in character. The Sunday 10am Service also includes a sermon and Holy Communion as well as special music from our Choir and hymns sung by the Choir and Congregation. Children who attend Church School join us after the Sermon. The first 10am Service of the month is a Family Service with our children participating in the liturgy. Thursdays at 10am we gather in the Tyler Chapel in the main Church Building for an informal Service with Holy Communion. We’re a healthy and thriving congregation of 250 families – large enough to have excellent programming yet small enough to enable personal connection with one another and with Father Richard. We’re a mix of long-time Hudson Valley residents, recent transplants from New York City and weekenders. Music plays a central role in worship at Messiah. Our choir combines volunteer members with professional singers enabling us to offer a wide range of high-quality sacred music each Sunday. Families come in many shapes and sizes here at Messiah . . . gay, straight, old and young. Our understanding of families is as diverse as our membership and all are welcome at our table. 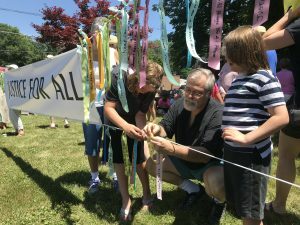 Messiah parishioners hang ribbons with their prayers at Messiah’s June 30th, 2018 Interfaith Service and Witness in support of Justice For All: Keeping Families Together. As important as Sunday Worship is, our life together is filled with many opportunities to serve others and to experience community. From the Food Pantry, to our Sunday Morning education forum, to the Third Thursday Luncheon program, the Messiah Community is busy and engaged. Click here to view a full list of our Programs. 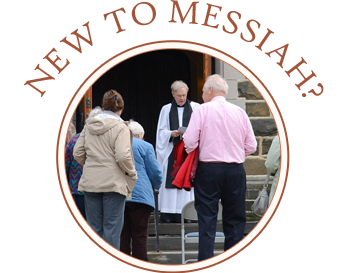 Once you’ve visited Messiah and feel comfortable that this could be your spiritual home, you may wish to become more involved in the life of the Parish and, perhaps to become a member. Membership is primarily defined by attendance. Fr. Richard is always available to talk about membership based on your personal experience. Whoever you are and wherever you’re from, you are welcome in God’s house. We greet you with the hand of fellowship and the assurance of acceptance in our midst. Please join us, even if you’re just in town for the day! and how you can join us.